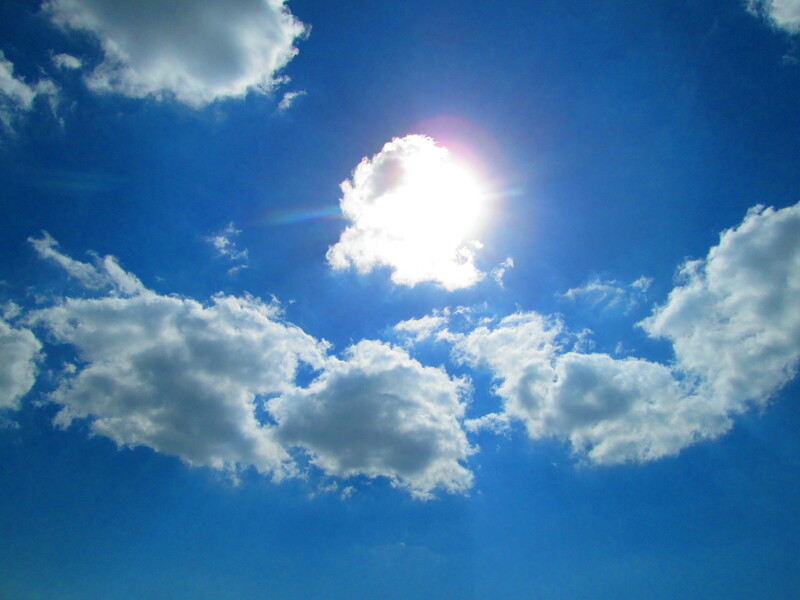 The weather has been beautiful this month – 80 degrees, sunny – and is perfect for outdoor adventures and explorations. One of our New Year’s resolutions was to have more adventures and an item on our adventure to-do list was to hunt for shark teeth. 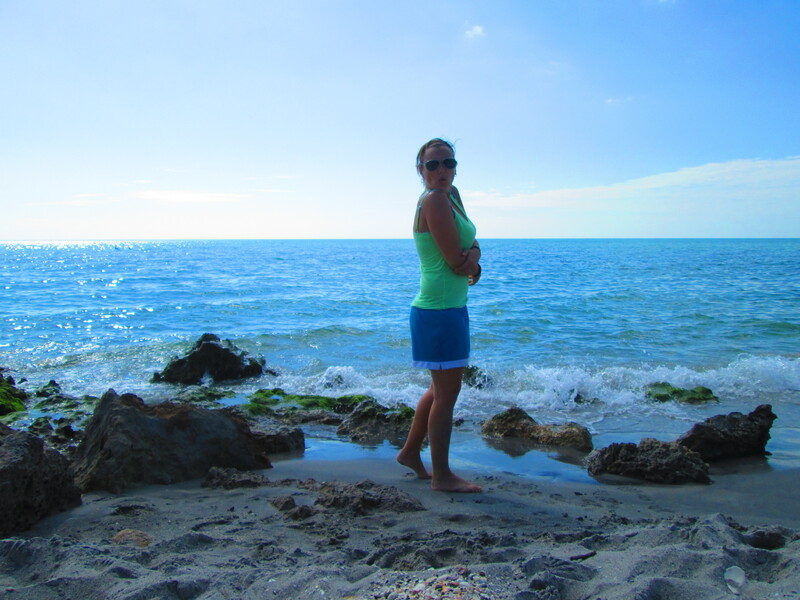 Yesterday, September and I jumped in the car and road-tripped down to Venice, Florida to get our hunt on. 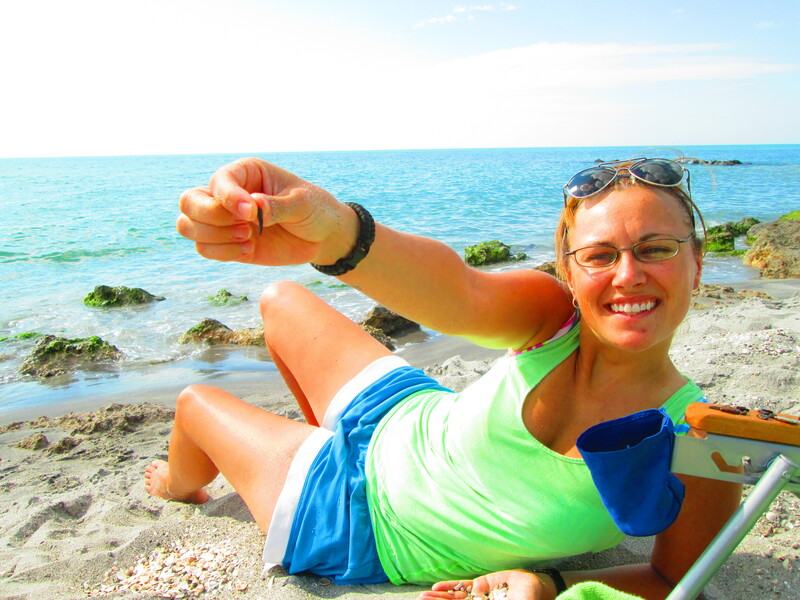 Just 50 minutes south of St. Petersburg is Caspersen Beach, located in Venice – Shark Tooth Capital of the World! 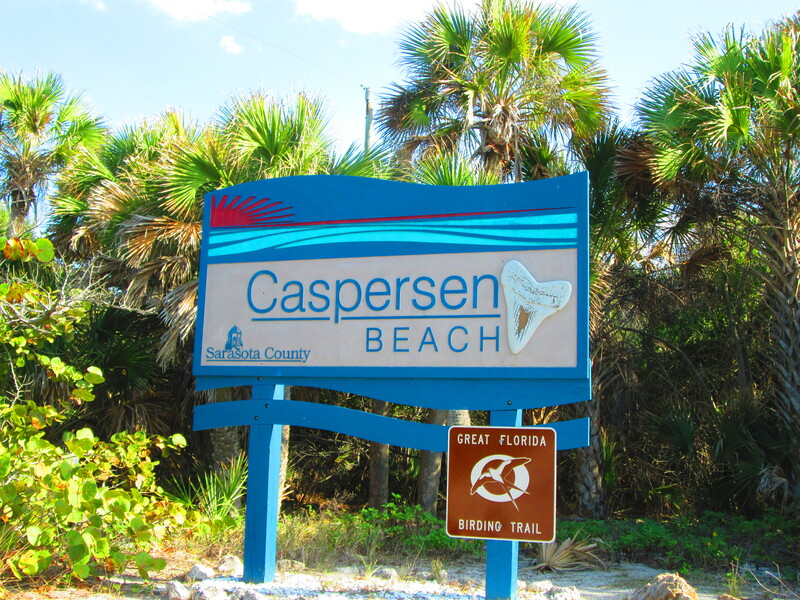 I had done some research online and Caspersen was said to be the best beach for finding loads of prehistoric fossilized shark teeth. 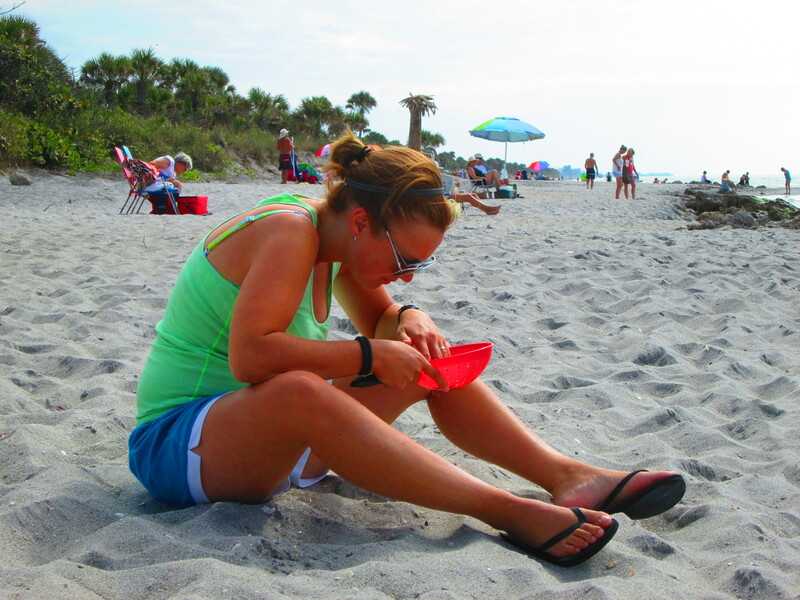 Forgetting that this is Florida’s “snow bird” season, we were not the only ones on the prowl for buried treasure. The beach was full of grannies and grandpas hunting in the water and in the sand for teeth. Not even kidding, we were probably the only people there who were under 65! While I had read that the best way to find teeth is to use a “Florida Shovel” aka a wire basket on a stick on it (retailing for nearly $30! ), September thought we could do just fine with our dollar store pasta strainer. September looking for shark teeth with our strainer. Ha! I was very reluctant at first and afraid of looking like a rookie but the more crowded the beach was, the more makeshift devices we saw! While I had read that the teeth are usually found along the water’s edge, Sep overheard a man explaining that the teeth are everywhere – in the water AND in the sand. Once you realize what you’re looking for, the teeth can be found in the sand right under your beach chair! Sep dug around in the sand like an archeologist on a mission! Apparently, the teeth on the beach are fossils some thousands (millions, maybe?) years old. They range in size and while we only found small teeth, we spoke to a woman who combed the water and found one tooth that was nearly 2 inches! Next time, we’ll come prepared with a heavy duty sifter and search the water for larger teeth. Hopefully the water won’t be as cold for September! September doesn’t like to go in the water until it’s in the 80’s (at least!). Growing up in Michigan, I used to swim in the Lake when it was in the 60’s – so the cooler Gulf temperatures don’t really bother me. I climbed the rocks and waded in the water collecting and sifting through sand. 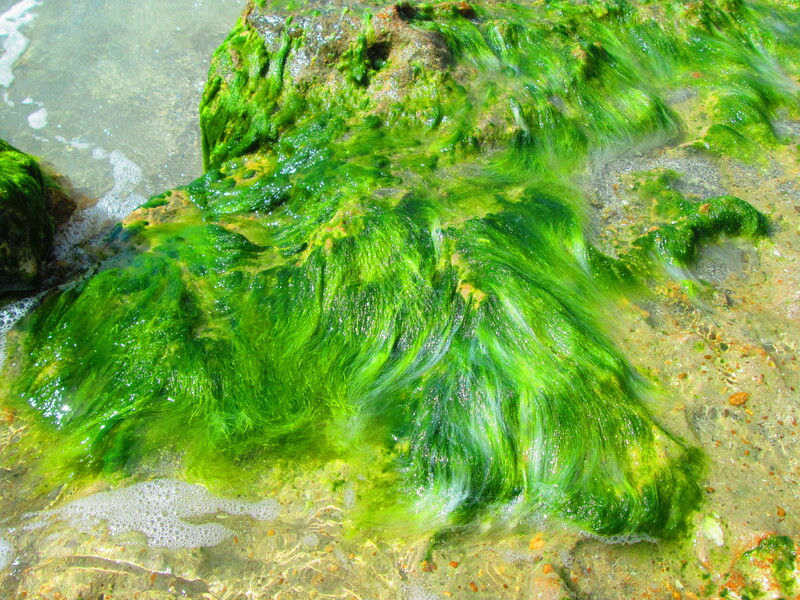 A rock covered in soft, fluffy seaweed. It felt like carpet! 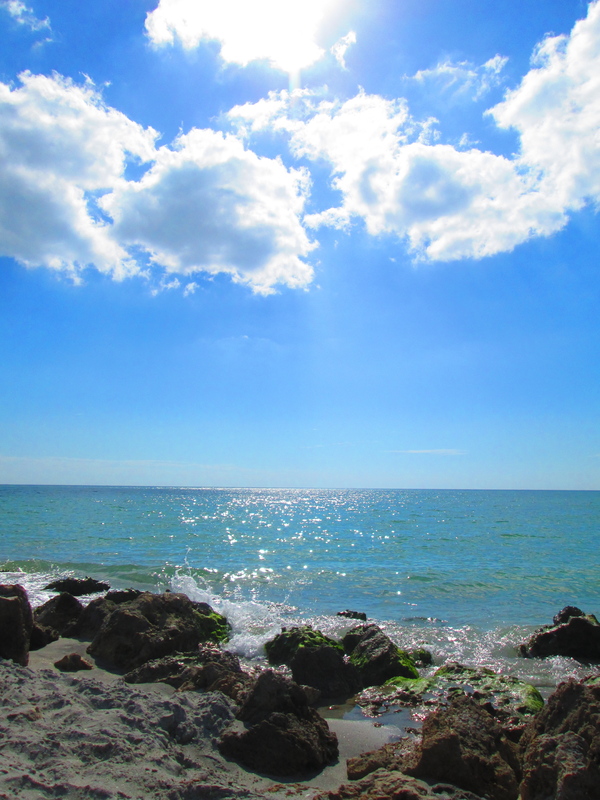 You can’t beat a warm January in Florida and we thing winter is a great time to be a tourist in our own state. 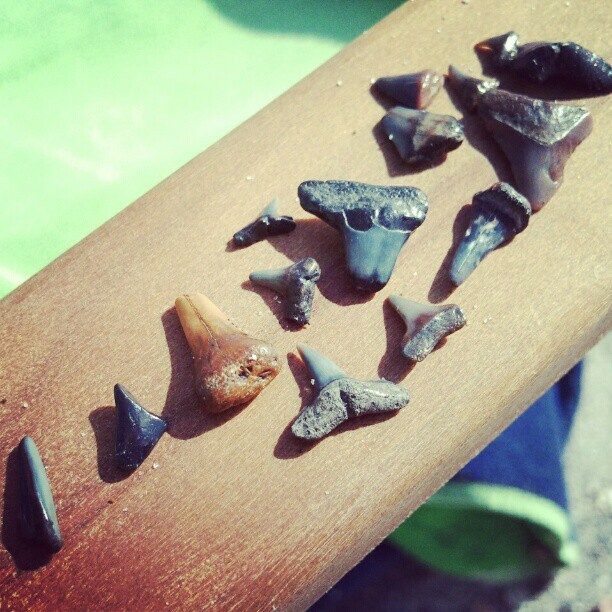 We’re excited to go back to Caspersen Beach and find more shark teeth. Who knows? Maybe they’ll make their way onto some Top Knotch Gear paracord survival bracelets! Oh my gosh! What a great adventure! Hunting for shark teeth is indeed one incredible experience! It was awesome! If you ever make it down to Florida, you should definitely try it. It’s just so crazy to find something so cool buried in the sand. Thanks for checking out our blog!